Social media has leveled the playing field for marketers at businesses of all size to connect directly with customers. And small, local businesses are seeing the benefits. In an average week, there are over 645 million views of, and 13 million comments on, local business Facebook Pages. Levy shares a number of examples of how local businesses have leveraged Facebook to grow their business, including Dixon, Illinois-based Distinctive Gardens, which saw a 40% increase in revenue from peak season sales based on Facebook promotions. He also invites other local businesses to share their stories with Facebook using this link: Submit Your Story. 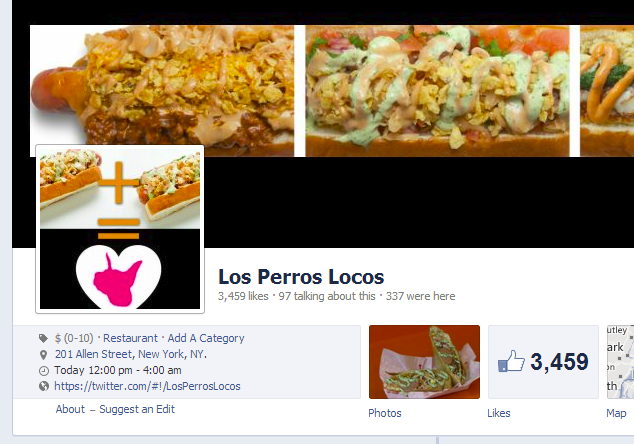 According to Alex Mitow, owner of New York City-based Colombian fast food restaurant Los Perros Locos, “the impact of social media and other online platforms with a social media component impresses me constantly. Something like 70% of my customers were driven through the doors of my brick and mortar store by what they had seen online.” Mitow maintains a strong presence on Facebook, where he amassed more than 3,000 followers before his restaurant even opened, a blog, a Twitter account, and has a growing community on Instagram. Are you connected to local businesses on Facebook? Do you think it’s worth the time and effort for a busy local entrepreneur to invest in the platform?